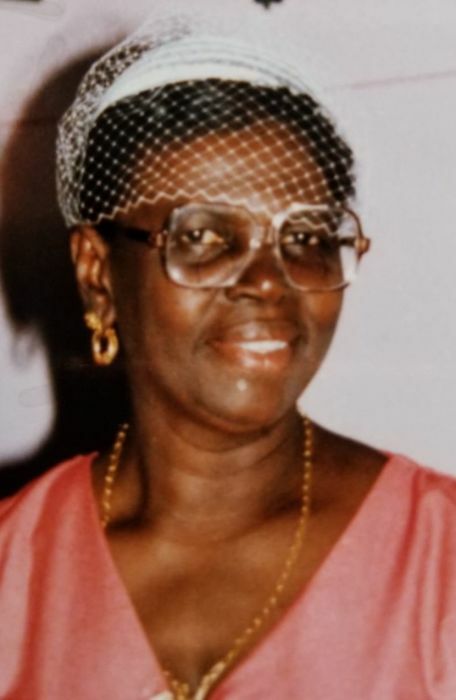 Obituary for Leona Z. Dey | Frank R. Bell Funeral Home, Inc.
Leona Zandrina Dey, daughter of (the late) Henry W. Dey and Stella Adams Dey, was born on June 21, 1928 at Plantation Ogle on the East Coast of Demerara, Georgetown, Guyana. She was the fourth of sixteen children. To her family and friends, she was known as “Nana”, “Mary” or “Leota”. Leona grew up humble and obtained a sound education at Ogle Canadian Mission School. After leaving school, she learned to sew and bake. Whenever a family member was getting married, she would bake the wedding cake, and she would bake that cake with lots of love. Another hobby of hers was cooking and yes, she was great at that too. She was so full of fun, always singing hymns or her favorite oldies tune, Tennessee Waltz, while dancing. Indeed, she was a great dancer. She loved to dress and party so she would sew her own clothing to go partying. To her family and friends, she was known as a small woman with a very big heart, larger than life and always willing to give a helping hand; a wonderful person who always wore a beautiful smile. She was independent and energetic and ventured off to live at Lenora Estate. Then the disturbance erupted and she was forced to move to Industry, at her parents’ home. Being the independent person that she was, she started working for Chancellor E.V. Luckoo where she remained for a number of years. She later started her own catering business. Leona joined her children and other family members in the United States in 1995, and was employed for a short while as a babysitter. As Leona advanced in age and her health declined, she became a resident of Linden Center for Nursing and Rehabilitation for a period of six years. Recently, her health worsened and she was hospitalized for three months. Sadly, our beautiful soul departed this life on Monday, December 3, 2018. She leaves to mourn and cherish her memory, two children: Norma and Feating; seven brothers: Churchill, Sherlock, Desmond, Kenneth, Henry, Cleveland and Wilgress; one sister Eumelza; four grandchildren: Latoya, Tracey, Jeremey and Ashley; four great-grandchildren: Khaina, Donte, Melody and Mia; one daughter-in-law Penelope; one son-in-law Nicholas; five sisters-in-law: Joyce, Joan, Carmen, Maria and Linda; fourteen nieces: Ann, Patricia, Denise, Lucinda, Gillian, Donna, Claudette, Yonette, Nathalie, Marie, Annyce, Shelly, Carla and Wenda; eleven nephews: Lancelot, Marlon, Virgil, Adrian, Roger, Benson, Tony, Michael, Travis, Deon and Courtney; several other relatives and a host of friends. AND YOUR MEMORY WILL LIVE WITH US FOREVER.